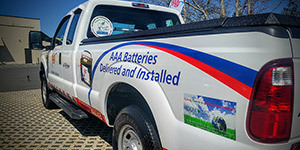 Connecticut’s West Hartford AAA claims a nationwide first as it has begun deploying propane autogas-fueled service trucks. 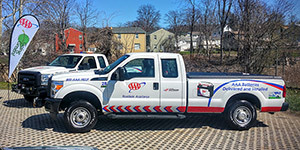 The vehicles have Icom North America propane-gasoline bi-fuel systems installed by Cusson Automotive in South Windsor, Conn.
West Hartford AAA has taken delivery of five Ford F-250s with Icom propane autogas systems. The first propane tow truck on an F-450 chassis is due this summer, and the entire 28-vehicle fleet is to be switched over to propane-gasoline bi-fuel operation by the end of 2017. “It’s not only the first AAA fleet but the first tow trucks to go propane in the U.S. as well,” says West Hartford AAA manager Glenn Chamberland. 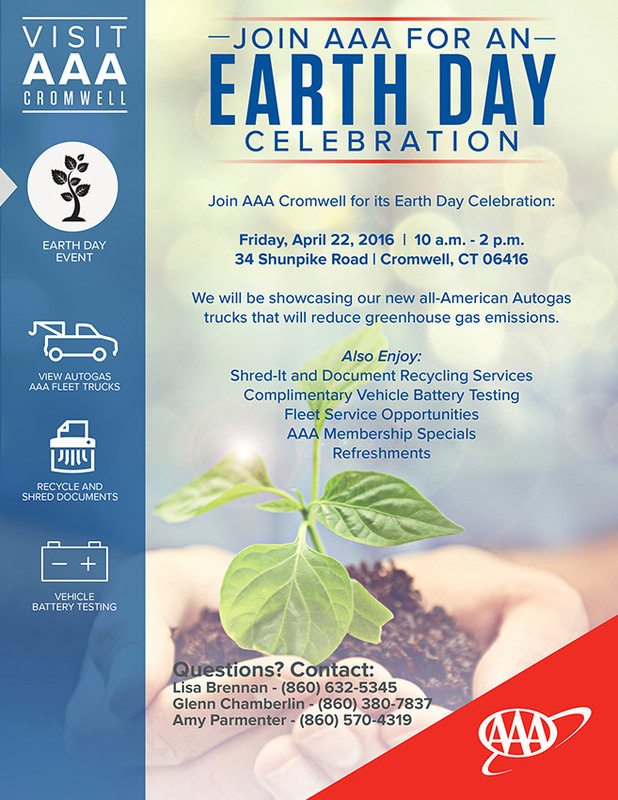 West Hartford AAA will show off its propane trucks at an Earth Day celebration starting at 10:00am on April 22 at the AAA facility in Cromwell, Conn., south of Hartford. Five propane trucks are in service now with a total of a dozen planned by year-end. By the end of 2017, the entire West Hartford AAA fleet of 28 vehicles will be propane-powered, Chamberland told F&F. The West Hartford AAA fleet is comprised primarily of Ford F-250 trucks with the 6.2-liter V-8 engine. The first propane-fueled tow truck based on the Ford F-450 chassis, with 6.8-liter V-10, will be introduced this summer. West Hartford AAA will phase out its existing Dodge and Hino flatbeds in favor of Ford F-650s next year, Chamberland says. The fleet logs from 1.4 million to 1.6 million miles per year, he adds, noting that West Hartford AAA is currently paying$1.21 per gallon for propane autogas. CNG/compressed natural gas is current going for about$2.42 per gallon in the area, he says. ​Hocon Gas, which has half a dozen Connecticut locations and operates its own fleet of propane-powered service trucks, is supplying the propane autogas fuel. Hocon and Cusson jointly support regional school bus and commercial fleets (F&F, June 23, 2015). Icom North America propane-gasoline bi-fuel systems are being installed for West Hartford AAA by Cusson Automotive. Six to eight of the trucks in the fleet are propane-fueled. The Ford F-250s and F-350s, which pull trailers, use the Icom liquid-injection propane system converted by Don Cusson from Cusson Automotive in South Windsor, Conn. The landscaping company formerly used gasoline- and diesel-fueled vehicles. The first truck conversion took place three years ago, another was converted about a year later, and last year the company converted four trucks to propane. The conversion of the mowers took place on a similar path. Tarantino converted two Exmark mowers about three years ago, and they worked well. Now the mowers come from Exmark already converted to propane. The same holds true for the propane mowers, most of which are Exmark Lazer 60-in. and Exmark Tracer 52-in., along with a couple 48-in. models. The mowers perform “exactly like gasoline mowers,” Dickson noted. Dickson added that the mowers have been well received by clients. The company performs much of its work around senior housing and schools, and he has heard compliments from clients about the mowers emitting no fumes, and they appreciate that the company is not polluting the air. Hocon Gas vice president of operations Bill Cummings noted that Hocon is active in the propane autogas business. Hocon services the Town of Shelton’s school buses and soon the City of Waterbury’s buses, along with a pump station for the town of Torrington school buses. About half of Hocon’s vehicles run on propane, including two Freightliner S2G bobtails. Hocon Gas has been in business more than 60 years. Tarantino and Sons Landscaping, founded by Generoso Tarantino in the 1950s, changed its name to Tarantino Landscapes in 1987. Generoso’s son Gino Tarantino, who is vice president and CFO of Hocon Gas, and Hocon president and owner David Gable became partners in the landscaping business about 10 years ago. 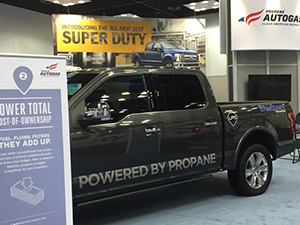 Propane industry press conferences and presentations, along with truck premieres, ride-and-drive opportunities, and training drew a record-setting 11,905 industry professionals to the Work Truck Show 2016 in Indianapolis. The show took place March 1-4 at the Indiana Convention Center and is produced annually by NTEA, the association for the work truck industry. Propane garnered a great deal of attention at the Green Truck Summit, held in conjunction with the Work Truck Show, which focused on alternative fuels and the latest on clean energy innovations for commercial vehicles. The Green Truck Summit session titled, “The Propane Autogas Advantage: Reduce Your Total Cost of Ownership,” included Glenn Chamberland, fleet manager for AAA Hartford Metro Emergency Road Service. 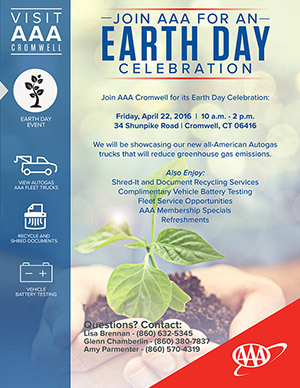 Chamberland discussed how AAA Hartford’s use of propane-fueled trucks has helped save on fuel and maintenance costs and lower incidents of fuel theft. The session also included Jay Massey, corporate fleet manager for AmeriGas (Valley Forge, Pa.), who addressed how his company uses propane in its fleet. Steve Smith, director of transportation for the Metropolitan School District of Warren Township (Indianapolis) talked about his fleet’s adoption of Blue Bird propane-powered Vision buses. Tucker Perkins, chief business development officer for the Propane Education & Research Council (PERC), moderated the event. Perkins told BPN after the event that Smith’s talk was “just what you want to hear from a fleet manager,” covering all of the positive impacts the switch to propane has had on the drivers, mechanics, and school district overall. Smith mentioned strong support from his fueling provider. Perkins also spoke at a session titled “Work Truck Trends and Outlook for Alternative Fuel Technology.” The session included representatives from the Electric Drive Transportation Association, NGVAmerica, and the National Biodiesel Board. Perkins commented that those groups noted declines in business between 2014 and 2015, partly because of low gasoline prices. But the propane autogas industry sold 3% to 3.5% more vehicles during that same time period. “I am glad to see that our buyers continued to choose propane vehicles because they saw the economic advantages over gasoline and diesel options,” Perkins said. In Perkins’ presentation, he talked about how the propane industry’s sales success in school buses makes a convincing case to managers of large truck fleets that can benefit as much as the school bus industry has from switching to propane autogas. He wanted attendees to think about why 10,000 propane school buses are on the road but not that many medium-duty trucks. “They’re going to have quieter vehicles, happier drivers, improved image from polluting less, and having a real differentiator between them and their competitors,” Perkins noted. PERC’s booth displayed an F-250 from the AAA fleet with an ICOM propane system, a vehicle from Bimbo Bakeries, an F-150 truck from Westport, and propane fueling dispensers from CleanFUEL USA and Superior Energy. Attendees could also visit Blossman Gas/Alliance AutoGas, CleanFUEL USA, Roush CleanTech, and PSI booths. Contact information is only available to premium subscribers. Click here to purchase a subscription.